Tempeh Stir Fry makes for an easy Asian themed healthy dinner ready in under 30 minutes. Made with Gailan and mushrooms, topped with a creamy spicy tahini sauce. Gluten Free and Vegan. 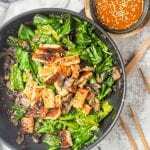 Tempeh stir fry – ever heard of it? Ever heard of tempeh for that matter? I first discovered tempeh years ago when living in DC and actively spending a large portion of my paycheck at the grocery store. I needed to test out this new enticing and strange sounding ingredient. It wasn’t until this year though that I saw tempeh thrive in it’s native environment – Indonesia. For those not familiar with it, tempeh, like tofu is a soy based product, but this one is fermenting cooked soybeans and then forming the mixture into a firm, dense cake. 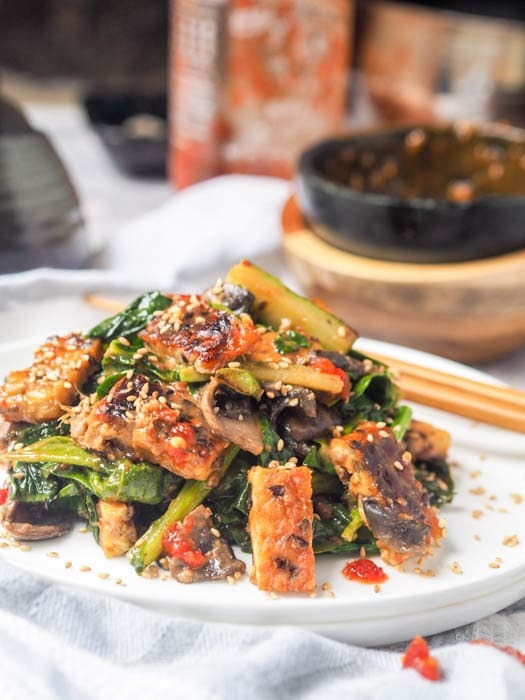 By itself tempeh has a strong nutty taste that can seem a bit dry, but it happens to be excellent at absorbing other flavors making it perfect in an Asian stir fry recipe. It holds up a lot better than tofu due to it’s firmer structure, making it an even better faux meat substitute in vegan dishes. I’ve loved it every since my first bite in DC, and after spending a month in Indonesia I really got to see how much the locals love to cook with it and how well it pairs with a rich peanut based dressing. In this tempeh stir fry instead of a peanut dressing I opted for a tahini dressing with a splash of tamari, chili garlice sauce (my all time favorite being this one), sesame oil and a bit of honey to balance out the saltiness. Once the tempeh is nicely browned and crisped up in a bit of oil you can just dip it into the tahini sauce directly, or you can take this dish to the tempeh stir fry level by adding in some veggies. I’m normally all about my shiitake mushrooms in Asian stir fry recipes (as in my vegan soba noodle stir fry with shiitakes and snap peas) but this time I had some button mushrooms on hand so opted to use those. And have you ever heard of Gai lan? This is also known as Chinese broccoli and is a leaf vegetable with thick green leaves and thick long stalks. I saw some at my nearby Wegman’s and knew it would be perfect for this tempeh stir fry. It has that broccoli-esque flavor but instead of florets you get that taste in the long leaves themselves. It cooks up quickly and blends perfectly with the hearty mushrooms and nutty tempeh. 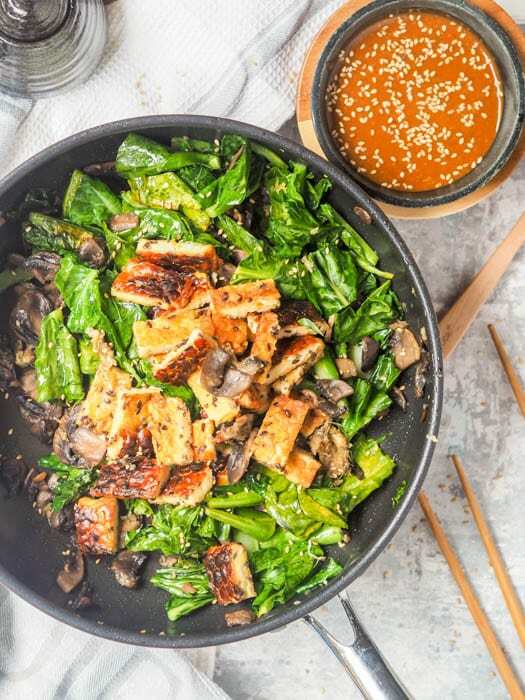 Each of these three component of the tempeh stir fry are cooked separately in a wok, but as is the norm in stir fry recipes everything cooks quickly. Then you combine all the ingredients and serve drizzled with the creamy tahini sauce. I love to drizzle a bit of Sriracha as the finishing touch too. 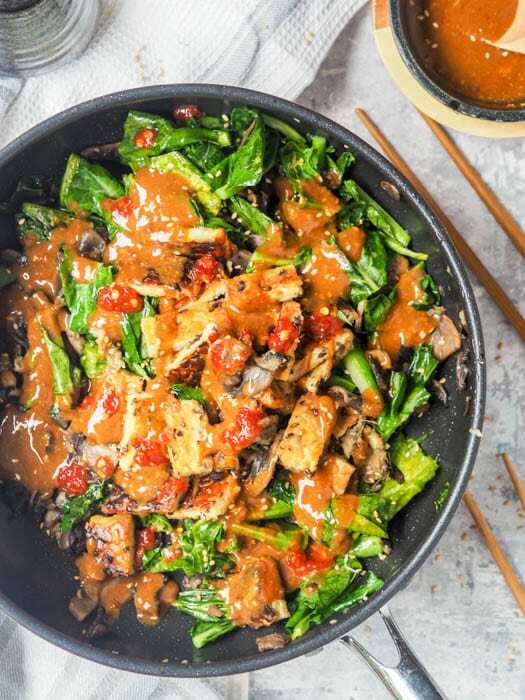 Overall this vegan tempeh stir fry makes for a super easy 30 minute weeknight dinner that is nutty, rich and earthy all in one dish. Heat 2 tablespoons oil over medium high heat. Cook tempeh until browned on each side, and remove from pan. To the same pan add 1 tablespoon oil and mushrooms, and cook for a few minutes. Remove from pan. To the pan add gailan, ginger and garlic. Cook for a few minutes. Add mushrooms and tempeh to the pan and mix. In a small bowl combine sauce ingredients until smooth. Serve tempeh stir fry drizzled with sauce. You can replace the button mushrooms with shiitake mushrooms and use broccolini or broccoli in place of the Gailan. I just made tempeh for my first time a couple months ago and loved it. This stir fry looks so flavorful and delicious!! Tempeh is the best! I love it too! I love tempeh too although I’ve mostly eaten it at restaurants and not at home. This recipe looks so amazing! Tahini is one of my favorite condiments (?)! I just love how nutty it is. I love making it into a dressing for salads. Tahini is the best! I love using it in dressing too! I love anything spicy. This looks absolutely amazing. I have been so into tempeh lately and have been looking for new recipes lately. This one really sounds delicious with broccoli and mushrooms. Thanks! Thanks! I am currently loving tempeh too! Honey is most certainly NOT vegan so this recipe should not be labeled vegan! Sorry about that! Meant to write maple syrup – I cook with both, and naturally make sure to cook with maple syrup for vegan recipes, just accidentally wrote in honey! I love the sound of this recipe! How many people does this serve? My favorite sauce. Love it. I just made your recipe tonight and it was absolutely delicious. I also added eggplant because I had some. So happy to hear that! Eggplant sounds like a great addition!